PDF Combine Nowadays, sharing and exchange information through internet is popular and important. Then if you want to share information with a large PDF file, do you feel difficult to upload and share quickly and smoothly? Then do you ever think about splitting the large PDF file into smaller PDF files? If you do, we recommend Split PDF for Mac (A-PDF Split for Mac) for you. Split PDF for Mac is an easy to use PDF tool to split large PDF files into smaller PDF files in order to upload, share and email easier and faster. PDF As we know that Split PDF for Mac is user-friendly PDF tool to provide professional split PDF solution for users. Then let's show you the feature of Split PDF for Mac. With Split for Mac, users can get start to import PDF file easily. And then you are able to select page ranges to split. For example, you can split all the pages or just split part of the PDF file. It is easy to understand. Anyway, you can split by every pages and split by bookmark. What's more, it allows you to extract and remove the PDF pages with ease. Just follow the example style to extract and remove the pages. After that, it is time to customize output settings. You are able to name pattern of your PDF file. And then customize the output folder. Furthermore, you can customize general, output properties, output security and sequence. 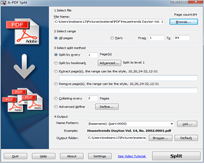 Once you finish customizing split settings, you can continue to split the large PDF files into smaller PDF files.